One of the common traps a lot of people will fall into is packing in large amounts of protein and calories but forgetting the importance of a balanced diet. I've been there myself and there comes a point when you need to realize that looking good is about feeling good too. Some of the things we put our bodies through and/or foods we take in do not make us feel good. You can look like a statue but without feeling good what the hell does it really matter? I've been reading a book one of my training clients turned me on to called Clean Gut: The Breakthrough Plan for Eliminating the Root Cause of Disease and Revolutionizing Your Health by Alehandro Junger, MD, which is an excellent read. This came at just the right time for me, because although I keep a very good diet there were things I picked up on from this book that definitely helped my insight on food intake, especially as an aging male who is trying to prioritize health just as much as staying jacked!! I have been dealing with irritable bowel syndrome for quite some time now. I'm pretty sure that's what it is, possibly food allergies as well. For starters, my body doesn't do well with dairy anymore and I'm trying to eliminate gluten from the diet. I have been using the bathroom (as embarrassing as this is to admit) a lot more than I should lately. I've also been dealing with hemorrhoids, which as much as I'd like to think came from lifting heavy weights COULD HAVE also came from dietary issues. If there is one area I was falling short in it would have been vegetable intake. I just wasn't getting enough vegetables and I knew it. If there was another area I knew I needed to improve it was quality protein intake in AMOUNTS I COULD ACTUALLY ABSORB!! Yes I get plenty of protein but maybe almost too much. I do not believe that our protein requirements are as high as common literature suggests!! From my understanding it's never been proven that the body uses more than .8 grams per pound of bodyweight in protein intake. Many of us are using protein as a filler to bridge the gap between a lower carb intake and fat intake, but not necessarily because we need more protein. The protein becomes a calorie filler in this case. This is the tricky part because we don't want to fall too much under daily caloric requirements, so it's easy to want to increase protein. The general thought process is the more protein the better. From my own experience, too much protein can make me bloated and sluggish feeling. I'm about halfway through the book “Clean Gut” and I've been implementing some of the dietary advice from the book over the course of the past few days and I noticeably feel much better….and stronger!! I'm keeping my current days meal intake to around 5 meals a day usually, with 80% of the meals being green veggies and 20% animal proteins. I have since dropped my eggs from a shitload of egg whites to free range whole eggs at just a few eggs per morning. Protein powders are used at just 1 scoop now blended in with half a cup of real apple juice and half a cup of unsweetened almond milk, a handful of blueberries and some kale. Now, once every 4-5 days I will do more carbs because I know that a bodybuilders fuel requirements are not the same as Suzy homemaker who just walks a few times a week. But 4-5 days on this new diet has me leaner, more energetic, and my strength levels have actually gone up!! I think that there is something to be said about getting a healthy balance of vitamins and nutrients from vegetables that many of us are lacking. Have you ever noticed that you're stronger when you eat vegetables? They have very few calories in them but the vitamins they provide are an important part of a well rounded diet!! My digestion has already gotten better in the course of a few short days as well. This article is geared more towards someone around my age or older (I'm almost 36), but I still stand behind a high caloric intake for the hard-gainer and/or younger trainee. But for the guy/gal who has already put on a lot of muscle, whose metabolism has gotten slower, or who is more focused on health and longevity over simply physically changing, then this way of eating may be for you!! I have gotten a good spike in energy levels from using Red Burner alongside the diet which is certainly helping as well. I lowered my daily coffee intake to 1-2 cups and I'm using 1 cap of Red Burner in the morning and another mid afternoon. See How to Get Shredded on Red Burner (Fat Loss Supplement)!! I can tell you that supplementing that along with minor dietary changes has leaned me out like crazy pretty damn fast!! The funny thing is that I still weigh in around 223 lbs, but harder and leaner!! I'm always reading and educating myself in the world of fitness and nutrition and I'd highly recommend checking out “Clean Gut” by Alejandro Junger MD. The book explains a lot on digestive health and eliminating root causes of disease by improving digestion. I love reading all your articles . This one really hits home with me as I have battled clinically diagnosed IBS for the last 5 years. It really is a daily battle. One thing that I have learnt is that in my opinion , there is no such thing as IBS , as one sufferer can have the total opposite symptoms as another sufferer . Rather, I think that people who doctors are unable to figure out what’s wrong with there gut, are diagnosed as IBS . My case is extreme , I ended up having my abdomen cut open and my intestines and stomach pulled out of the cavity and inspected . Hell of a scar and the procedure made things worse . With me , vegetables actually set off my IBS . And too much starch ie, bread rice or pasta . Each person is unique and only the sufferer them self can figure out the foods that set off the IBS . Exercise is very important too. You need to keep moving . Always have some good yogurt in the fridge , and as for the hemeroids ….. I feel your pain. I hate bulking , more food intake means more discomfort , however in a cut when I’m very strict in calorie intake , I feel at my best . 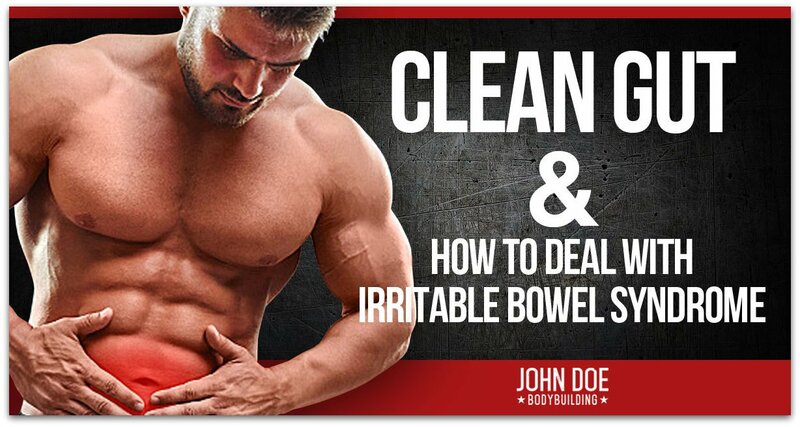 great info bro..even i am suffering from IBS from few months. This article is a great read in terms of decreasing my symptoms. I’m glad everything went well. I myself have had a form of IBS for years but have learned how to manage it. Luckily I suffered from it early on and now don’t suffer much.